One of the more common nerve entrapment problems affecting the lower extremity is Morton’s neuroma. The term, neuroma, is a bit of a misnomer because this condition generally does not involve a true neuroma, which is essentially a nerve cyst or tumor, and instead involves nerve impingement in the forefoot region. In most cases it is strictly a nerve compression syndrome, although the problem can be caused by fibrosis of the tissue around the nerve. This condition is also sometimes called Morton’s metatarsalgia (which means metatarsal pain) or interdigital neuritis. Morton’s neuroma is a nerve compression problem in which massage can play a significant role in reducing symptoms. This nerve compression problem is sometimes confused with Morton’s foot, which is completely different. A Morton’s foot is a structural classification of the foot in which the second metatarsal is longer than the first. This makes the second toe appear longer than the hallux when looking at the foot. However, the Morton’s foot does not have anything to do with the nerve compression that occurs with Morton’s neuroma. Sensory signals for the forefoot and toes are supplied by the plantar digital nerves. The digital nerves are the terminal extension of the medial and lateral plantar nerves, which in turn are divisions of the tibial branch of the sciatic nerve (Image 1). A closer look at the pathway of these plantar digital nerves indicates why they are susceptible to compression between the metatarsal heads in this condition. The metatarsal heads are bound together by the deep and superficial transverse metatarsal ligaments, which create a small opening or tunnel between the metatarsal heads. The plantar digital nerve branches course through these small tunnels between the metatarsal heads (Image 2). 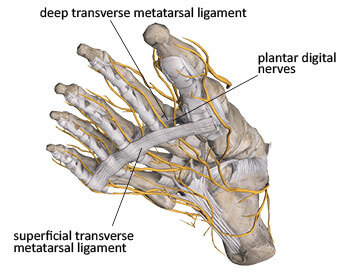 The path of the plantar digital nerves between the superficial and deep transverse metatarsal ligaments is quite narrow. At the same time these nerves must pass between the metatarsal heads, and that makes their tunnel of passage even smaller. While nerves can be compressed between any pair of metatarsal heads, the most common location for plantar digital nerve entrapment is between the third and fourth metatarsals. The space between these metatarsal heads is smaller than between any other pair. Another factor leading to potential entrapment of the plantar digital nerves is an anatomical anomaly in the division of nerve fibers. There can be a connecting branch between some of the adjacent digital nerves originating from the medial and lateral plantar divisions. When this connecting branch is present, it increases the potential for compression pathology because the nerve group is not as mobile. There are other key biomechanical factors that routinely lead to Morton’s neuroma and we’ll look at these next. Plantar digital nerve compression affects women more commonly than men. In fact one study found that women were 10 times more likely to develop this problem.1 One reason for this is because of high-heeled shoes. When the heel is lifted higher than the forefoot, it essentially jams the foot into the front portion of the shoe, thus squeezing the metatarsal heads tightly together, which increases compression on structures between the metatarsal heads. Narrow toe box shoes are a frequent contributor to plantar digital nerve compression. 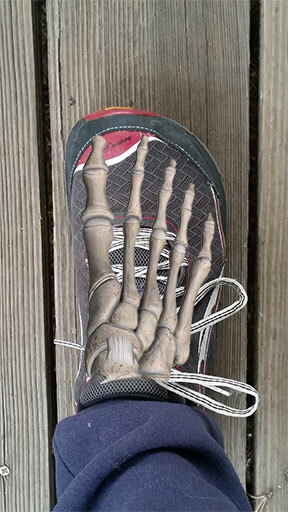 Any shoe with a narrow toe box can increase nerve compression by squeezing the metatarsal heads together. The narrow toe box is most prevalent in dress shoes for both men and women, but also can occur in other shoes like cowboy boots. The biomechanics of the foot during locomotion also plays a prominent role in digital nerve compression. During the push-off phase of the gait cycle there is hyperextension at the metatarsophalangeal joints (Image 3). When the toes are hyperextended, the plantar digital nerves are bowstrung against the deep transverse metatarsal ligament and are pulled taut. This foot position increases irritation of the nerve, especially if it is already being compressed by adjacent structures. As a result, clients often complain of increased pain when the toes are extended in the push-off phase of gait. 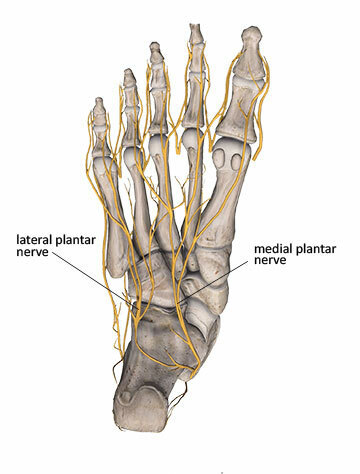 The plantar digital nerves are sensory nerves so when they are compressed, the primary symptoms include numbness, paresthesia, and most commonly shooting electrical, or burning sensations into the toes. The pain is usually described as very sharp and specific in nature, not the dull or diffuse aching that is common with other disorders in the region. The most common region for digital nerve entrapment is between the third and fourth metatarsal heads so most symptoms occur in the third and fourth toes. It is certainly possible to have digital nerve compression in other toes, but it is much less frequent. Clients are likely to report aggravated symptoms when they wear specific shoes, especially those with a narrow toe box. These symptoms may also increase when wearing shoes that are laced tightly. Because of the tensile stress on the nerve during toe extension, it is also common for symptoms to be increased when ascending or descending stairs. Nerve compression problems can be challenging to confirm through diagnostic testing. Highly precise diagnostic imaging like MRI can show the spatial relationship between adjacent structures, such as whether or not a nerve is close to a bone. However, this imaging does not necessarily indicate that nerve compression exists. In these cases, clinical evaluation is the most effective method for accurately identifying the problem. Numerous studies have indicated that a complete and thorough clinical examination is more effective than MRI in identifying the presence of digital nerve compression in Morton’s neuroma. That is good news for massage therapists because it emphasizes that accurate assessment of the tissues involved (nerves) can be determined without the need for MRI or other high tech imaging. In addition to the specific clinical symptoms that might point to digital nerve entrapment, there are additional evaluation procedures that may be helpful in assessing these symptoms. Because the nerve is deep in the foot and located directly between the metatarsal heads, it is not feasible to reproduce symptoms through superficial palpation only. The following special evaluation procedures are designed to apply stresses on the plantar digital nerve branches that should reproduce symptoms if the nerves are being pathologically compressed or irritated. The interdigital squeeze test is one of the most commonly used procedures for identifying plantar digital nerve entrapment. One finger is placed on the dorsal surface of the foot in the space between the suspected metatarsals (usually between the third and fourth). The thumb is placed on the bottom surface of the foot (Image 4). The two fingers are squeezed together with a moderate amount of pressure. If this reproduces sharp neurological sensations into the toes, this is a good indication that the digital nerves are entrapped. The Morton’s test is another commonly used procedure for assessing nerve entrapment between the metatarsal heads. In this procedure the practitioner places the palm of one hand on the medial side of the client’s foot near the metatarsophalangeal joint. The other hand is placed on the lateral side of the foot at the fifth digit MTP joint (Image 5). The practitioner then applies a moderate amount of pressure by squeezing the hands together. Make sure not to curve the transverse arch, but instead press the metatarsal heads directly towards each other and keep them in alignment. If symptoms are reproduced with this pressure, which mimics that of a narrow toe box shoe, there is a good chance that digital nerve compression is involved. The most important goal in addressing any nerve compression problem is to remove or lighten the pressure on the nerve. Tissue healing will generally occur as long as the aggravating biomechanical forces (compression or tension) are removed. The most common strategy used is changing footwear away from narrow toe box shoes to give the foot more room to spread out inside the shoe. Some footwear companies are now recognizing the importance of shaping the shoe to meet the structural needs of the foot. An example is the ALTRA running shoe shown in Image 6. This larger toe box not only decreases compression on the metatarsal heads, but allows more room in the shoe for other therapeutic devices, such as domed pads, which are often placed underneath the metatarsal heads to help spread the digits apart. There are other products like Yoga Toes® and Correct Toes® that can be worn between the toes with certain types of shoes or when the client is barefoot. These toe spacers will help reverse biomechanical patterns that aggravate the nerve compression. Don’t underestimate the value of a relatively simple treatment like changing footwear. When nerve tissue gets aggravated, it can cause an increased degree of sensitivity throughout the entire nervous system and may become a self-perpetuating problem. A relatively simple problem like Morton’s neuroma can develop into a more problematic and long-lasting condition, with more severe nerve irritation throughout distribution of the affected nerves and their trunks. Traditional medical treatments generally focus on reducing the irritating symptoms so the nerve does not continue to increase in sensitivity. Corticosteroid and anesthetic injections are common methods used to address the nerve compression symptoms. However, if the biomechanical factors that led to this condition are not addressed, simply attempting to reduce the pain through medication alone will have only limited or short-term effectiveness. Other traditional medical treatments include shockwave therapy, capsaicin applications, physical therapy, or surgery if none of the more conservative treatments are successful. Surgical procedures involve excision (cutting) of the plantar digital nerve. Cutting this nerve will reduce the pain sensations but the adverse effect is that there is also significant loss of sensation in the toes as a result, which could result in other problems. Massage can be helpful, but should not be performed with deep pressure between the metatarsal heads. Additional pressure in this region can aggravate the nerve compression and prolong the pathology. Practitioners should also be careful when stretching the toes in extension that symptoms are not aggravated. Techniques like metatarsal spreading or joint mobilizations that encourage full freedom of movement of the metatarsals are definitely helpful. Long-lasting results are unlikely though with just a single soft-tissue treatment intervention; multiple applications are recommended. Also, keep in mind that the condition likely developed from ongoing compressive forces on the forefoot. Just helping spread those metatarsals or relax the foot muscles is a big key, but the biomechanical problem that led to the condition in the first place must be addressed and reversed. Therefore changing footwear or addressing the constant biomechanical metatarsal head compression is key as well. It is easy for a condition like Morton’s neuroma to be misidentified as other problems like sciatic nerve pain or plantar fasciitis. The most effective treatments need to be properly coordinated with the nature of tissue dysfunction. The practitioner who is able to identify the key biomechanical characteristics and symptom patterns associated with plantar digital nerve entrapment will be far more successful in helping resolve these issues with their clients. Jain S, Mannan K. The Diagnosis and Management of Morton’s Neuroma: A Literature Review. Foot Ankle Spec. 2013;6(4):307-317. doi:10.1177/1938640013493464.